ECHO Jazz 2012 Big Band Album des Jahres: Joachim Kühn + hr-Bigband At Jazzfest Berlin "Out Of The Desert"
Oliver Leicht has played saxophone and clarinet in the HR Big Band since 2005. In 2009 he was chosen to write a program of music for the band as a part of the “Inner Voices” concert series. For the rehearsals and concerts he swapped his chair in the saxophone section for the conductors podium. In addition to conducting the band he contributed his clarinet playing to the performances. The result of that project can now be heard on the CD “composed & arranged”. 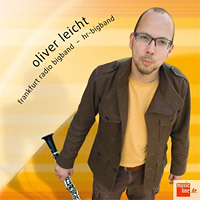 Nine original compositions from Oliver Leicht performed by one of today’s top big bands. In the words of Oliver Leicht: “It was a great feeling to be able to write music for such excellent musicians that I know so well and work with every day. It is not just the wealth of orchestral colours and textures that make this recording special, it is also the way that Oli Leicht writes for the soloists of the Frankfurt Radio Big Band. He finds fitting environments for every soloist and gives them room to shine. Excellent soloists, a great band and wonderful compositions from Oliver Leicht combine to make this one of the most important large ensemble releases of 2012.